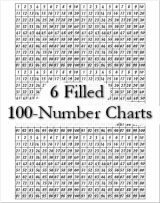 Various sizes of Printable 100-number charts that may be added to your personal homeschool curriculum, or for classroom use, or for use at home. Don't miss the section "Using 100-Number Charts" that is at the bottom of the page! Introduction to Multiplication- "Counting By"
Is it divisible by 3, 6? Set One is a small set of 6 printable charts. Each chart prints over most of the printer paper, which just means that it has big squares and big numbers. The lessons that set one features are #1. counting by 3's, #2. counting by 4's, #3. even numbers, and #4. odd numbers. Check how well the child is doing in this topic with the rest of the printable files. Set One is made using the font that is named "kids", which is a rather childish looking font. I don't remember why I chose to use it; I made these files a very long time ago. If the font is an issue then please skip to the next set of charts - Set One B. This set is similar to the set above in both size and missing number sets. Set One B is a set of 9 printable 100-number charts. Each chart prints over most of the printer paper, which just means that it has big squares and big numbers. #1. counting by 2's, #2. counting by 3's, #3. counting by 4's, #4. counting by 5's, #5. even numbers, and #6. odd numbers. The rest of the printable files, numbers 5 and 6, could serve as a quiz of sorts to see how well the child is doing in this topic. 1. 100-by 2's - Count by 2's - " Count by twos and write the missing numbers"
2. 100-by 3's - Count by 3's - " Count by threes and write the missing numbers"
3. 100-by 4's - Count by 4's - " Count by fours and write the missing numbers"
4. 100-by 5's - Count by 5's - " Count by fives and write the missing numbers"
5. 100-even - Missing Even Numbers - "Even Numbers - Fill in the missing even numbers." 6. 100-odd - Missing Odd Numbers - "Odd Numbers - Fill in the missing odd numbers." 7. 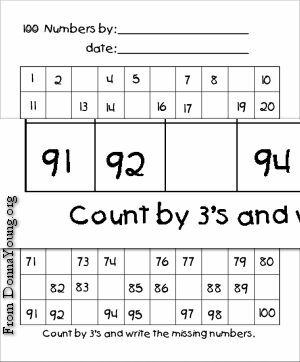 100-count-all - No Numbers - Count All - "Count to one hundred and write the missing numbers"
I'm sure that some of you would like to have a typeable area on the printable file for lesson plans or games. I have two typeable 100-number charts. The first one, the PDF is only typeable in the bottom part of the file (see image on left). This typeable area could be used for "directions." The second file is a "doc" and the entire file can be typed on, but please leave my name and URL on the file. Hundred Number Chart - Entire file can be typed on, and please leave my name and URL on the file. Set 2a, set 2b, and set 2c will have two 100-number charts per printed page. Set 2a includes 18 printable files, half of which are for YoungMinds subscribers. Each file will have two 100-number charts and the file name describes the 100-number chart. The first group of files are the "Count by" charts on which the missing numbers are divisible by a certain number. The next group of files consist of basic charts—filled and blank and charts will have a certain amount of missing random numbers per row. The file name will be something like "Missing 3 Random Numbers per Row". This is not the same as "count by 3", this is 3 random missing numbers. Sets Two B and Two C have two charts per printout. The top chart will have missing numbers in mostly the left side (2B) or the right side (2C). The bottom chart will have a random number of missing numbers throughout. The order in which the worksheets are presented does not matter because all of the missing number 100-number charts in Sets 2B and 2C are random. For that reason, the individual files are identified with numbers. I'm grouping these files because of their similarity. The groups of files will be labeled either Left for Set 2B or Right for Set 2C. The file names describe the printout. The Before and After chart instructs the student to "Write the Numbers in the Gray Areas". -Choose which type of chart to use from the choices above - either filled in or blank or one that has missing numbers. If using a fill-in type chart, obviously the child will have to complete the chart first. -Choose which number to "count by" : 2's; 3's; 4's; 5's; etcetera. -Last, slot the lessons in your planner and do the lessons. The chart pictured here has been highlighted by 2's. The student could start learning a few math tricks by observing the patterns in the chart and the numbers. Observing and checking if highlighted number is divisible by 3: This chart has been highlighted by 3's, so clearly every number that is highlighted will be divisible by 3, but there is something else to notice. The sum is 18, 18 is divisible by 3, and therefore; the number 927 is divisible by 3. Note: 927 is also divisible by 9 because the sum of the digits  is divisible by 9, but it is not divisible by 6. Why? The answer to Why is 927 not divisible by 6 when it is divisible by both 3 and 9? 927 is an odd number and not divisible by 2. Continue reading to find out how to check if a number is divisible by 6. Divisible by 6: Numbers are divisible by 6 if they are divisible by both 2 and 3. Lesson- Print a 100-number chart and highlight the 2's with one color and highlight the 3's with another color. Check - Discover if the numbers that have both colors are divisible by 6. The sum of the individual digits in 891027 equals 27, 27 is divisible by 9, and therefore; the number 891027 is divisible by 9. Each multiplication chart is missing a set of numbers that are divisible by a certain number. The student may observe the pattern of missing numbers, fill in the missing numbers, and complete the multiplication problem set.